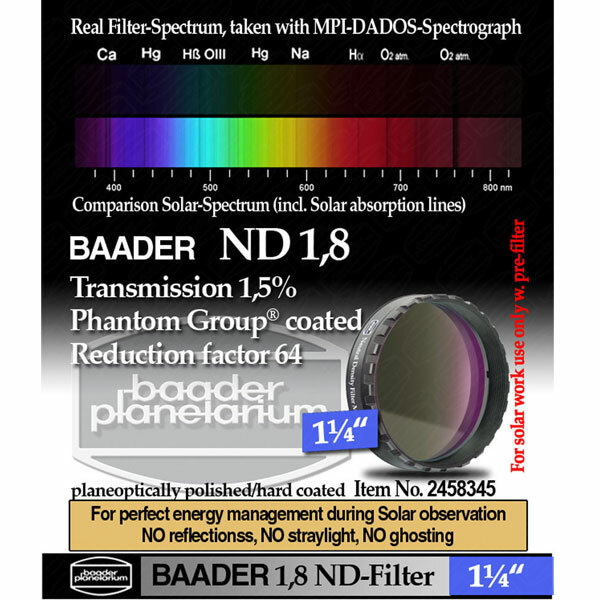 For the discriminating observer, Baader offers a line of premium Neutral Density filters. These filters are planoptically polished with Baader's famous Phantom Coating Group Multicoatings. The result - no reflections, no straylight, and no ghosting, offering performance unlike any other competing filter on the market today. 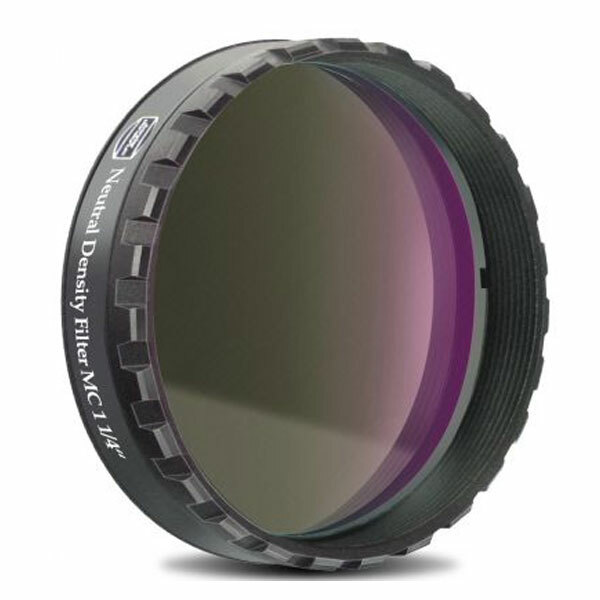 This 1.25" filter has a neutral density of 1.8, so its transmission factor is 1.5%. It has a standard 1.25" male filter thread (M28.5x0.6) so it can be screwed on to virtually any astronomy eyepiece or accessory that has 1.25" filter threads. Also features a standard 1.25" female filter thread on the other side, so it can be stacked with additional filters. Cell thickness = 7.7mm (0.30"); Clear filter aperture = 26.4mm (1.04"). Neutral density filters are excellent filters to reduce the overall brightness of an image to cut down glare while viewing bright astronomical objects through a telescope. They are useful for splitting binary systems, comfortably observing the moon, or stacking with other planetary filters. ND filters retain true color balance of the objects being observed since all wavelengths are transmitted uniformly over the entire spectrum.